The ‘Gort Line‘ was a series of concrete bunkers built by the British Army during the Phoney War period in France during the winter of 1939/40. At this time the British Expeditionary Force (BEF) under their commander Lord Gort VC were preparing for a re-run of the Great War and static positions like these were considered essential. When the Blitzkrieg broke in May 1940 very few of these bunkers saw action, as most were by passed in the fluidity of the fighting at that time. Many saw fighting again in 1944 when German troops used them as the Allies advanced across France and into Belgium. 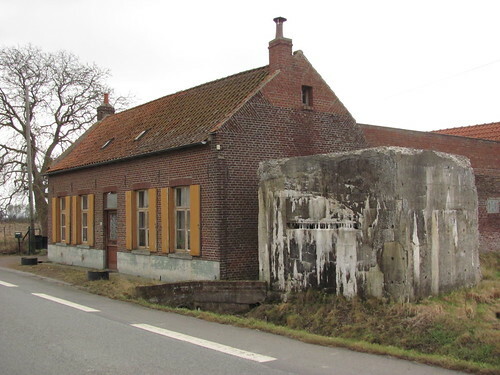 This example is on the main road near the town of Orchies in Northern France. It is one of a large number in this area built amongst existing French constructions on what was the frontier line. This bunker directly overlooks the border just over a mile away and appears to have been constructed to house a Bren Gun team or possibly a Boys Anti-Tank Rifle. Hello, is there any evidence left of work done by the BEF near Tourcoing? My grandfather was in 2nd Lancs Fusiliers and was based there at the end 1939. Thank you for any help.